Would you use compatible ink cartridges or refills? Discussion in 'Everything Else InkJet Printer Related' started by davidblakey, Nov 2, 2018. This may be an ancient concern among printer users/buyers but I'm nevertheless raising it again just to know your two cents. As we're all aware, genuine printer cartridges are very expensive. Unless you have a stable income stream that allows you to allocate budget into buying original cartridges as soon as they run their course, cartridge expenses can be crippling in the long run. No wonder people prefer to purchase ink refills or compatible ink packs because they get about the same level of service but for a fraction of the costs they should incur. Is this set-up good enough for you or would you rather purchase genuine inks or toner cartridges, regardless of your available budget? I prefer to refill my Canon MP830 with quality aftermarket bulk ink. But, if money were no issue.... OEM Canon all the way. apetitphoto, The Hat and davidblakey like this. Then it pretty much depends on your financials. If I were selling my prints then I would use OEM Canon because for dye-based inks, OEM Canon ink has the best longevity by far. After market dye-based inks typically fade faster than a fat man in a sprint. However, pigment-based inks have excellent fade resistance whether OEM or aftermarket. 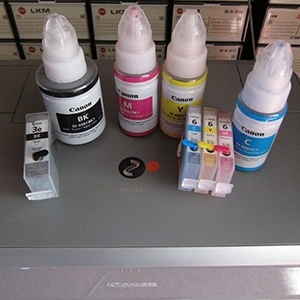 Of course you should use best quality aftermarket inks for best results. I say it again: unless you only print to throw away forget refilling dye printers. Easy refillable Canon pigment printers are the Maxify for office and the PRO-10 for photo (no more printheads available for the PRO-9500). no more printheads available for the PRO-9500). There are still some available in the EU, but they’re €300.. I can't resist hoarding 9500's again . Since getting my first Pro 9500 MK2 back in 2009, my love for these printers has not diminished one little bit, they are truly awesome printers.